1. Anything you do not know how to use or will not use now. So many preppers have items in their preps that they have no clue how to use. This can be anything from a crank radio to small solar panels to weapons to generators. You need to be familiar with and know how to use your preps. If you don't know how to use it now, how will you be able to use it in an emergency? The same goes for any preps you will not (or refuse to) use now, but have just in case you might be forced to. What is the point of having them then? You should be familiar with and ready to use anything you have in your preps. If you will not use them now because you are not comfortable with them, then why have them? I see this a lot with the weapons that preppers possess. They have guns that have never been fired or even loaded. They have no idea how to load, shoot, or clean the gun, but they have a gun just in case. It will not do you any good if you don't know how. That goes for all your preps. You need to know how to use them and practice using them. Otherwise, don't have them because you or they will be dangerous without the knowledge and practice of that item. 2. Anything that is single use and not imperative to survival. A lot of prepping items are single use: food, soap, bullets, etc. Those things are also important for survival. However, a lot of new preppers accumulate gadgets that are cheaply made or are only single use. In a short-term situation, that would be fine, but in a long-term situation that could be disastrous. Your tools in prepping should have more than one use if at all possible. You should be learning about all the different ways to use those items. Preppers should also carefully consider whether the items they have set back for preparedness are really essential to survival. Many things can be used in a pinch, but they are not really preparedness items. An item I see a lot in preparedness lists are solar lights. I have even included them in lists, but here is the thing about solar lights - they need the sun to power and charge them. They are worthless during a snowstorm because there is no sun to charge them. They may provide some light, but they will never be better than a good lantern or a candle. They also do not get a good charge in the winter which will shorten their light life on days when the dark is longer than the light. So solar lights are not really essential to your prepping items because there are better items to replace them. 3. Anything with a short shelf life. This applies to mostly food storage but can apply to more. A lot of food storage should be food with long shelf lives so you can have plenty of food on hand and not have to worry about spoilage. However, I see a lot of people include what they have in their fridge and freezers as part of their long-term food storage. That is okay to do, but when the freezer quits running or the power is off for an extended period of time, your freezer food just became perishable. You might have a generator to keep it running, but for how long? Your long-term food storage should be items that you can keep on the shelf and be able to store for at least a year, but 2-10 years is better. If you are planning on the meat and vegetables in your freezer to be part of your long-term food storage, you need to can them. If you can them, they just got an extended shelf life that will not depend on whether you have power or not to stay edible. 4. Anything electronic or relies on electricity to run. A lot of preppers use electronic means to store information, important documents, and reference materials. While that sounds like a good idea, in theory, most preppers lack the long-term abilities to charge and maintain those electronics. You may not think about long-term power outages or a power surge taking out your electronics, but when it does, you will be out of luck. Print out and purchase paper reference materials. You can still store your information on flash drives, SD cards, ebooks, and tablets, but keep a paper copy as a back-up. Keeping some basic reference books on hand will also give you a peace of mind. 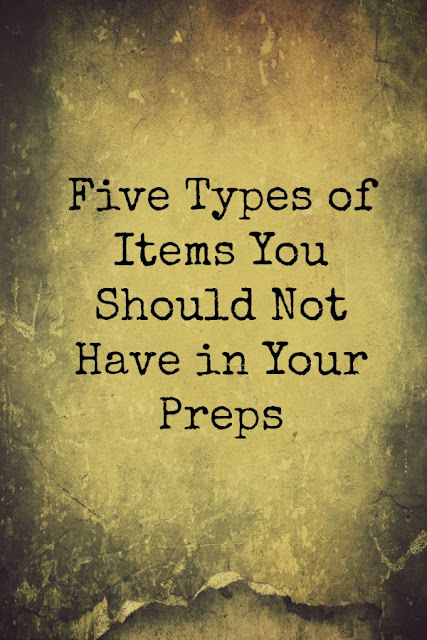 The same goes for tools and other items you have as part of your preps that require electricity. If your drill requires an extension cord to run, it should not be part of your preps. A battery powered drill is better, but will still need electricity to charge the batteries. Unless you have a solar panel to charge those and adequate sunlight, your drill should not be part of your preps. A hand powered drill would be a better option, but you need to use it to understand how much work it will take to power it. 5. Seeds and roots. Survival seed banks are very popular items for sale online nowadays. They are usually a good purchase for the price, but there is one thing they leave out in the advertising. They are usually not good for longer than a year or two. Most seeds lose their rate of germination after a year or two. Even if the seeds are stored in mylar with an oxygen absorber, they will not last any longer. While having one or two of these packets on hand is not a bad idea, you should be learning how to save seeds yourself so you can continue to plant a garden for the next year. While some seeds do last for longer than a year, you need to be aware of what seeds those are. Most seeds need to be planted and replaced in your stash every year. I also see people keep roots and tubers in oxygen absorbers and mylar bags in their preps. This also does not usually work out because they will either rot or dry out and will not produce when planted. If you want to plant items that need roots or tubers to get started, plant them now. Most of those items are perennials anyway so you can plant them now to get them started. You can always save a few potatoes back every harvest to start the next year's crop. Just don't try to save them as part of your preps. Honestly, the most important prep you need in your preps is common sense. With common sense, you will be able to understand what you need and don't need in your preps. In addition to common sense, gaining and having knowledge will improve your ability to decide what you need and don't need.